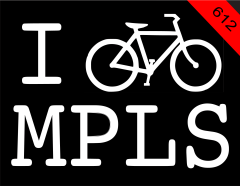 It's the MPLS chapter of the Ride of Silence, tonight at 1900, starting at Cars-R-Coffins at 34th and Lyndale - the shop closes at that time, so get there early if you need to grab something to go. We will be meeting at the Cars R Coffins at 3346 Lyndale Avenue South Minneapolis, MN 55408 and then riding east via the Greenway bike trail. When we hit the uptown bus station we will take to the streets and ride. I have not contacted police about this. If anyone is willing to help me I have never organized an event like this so would MUCH appreciate any help I can get. Also, The Ride of Silence is to mourn those cyclists killed or injured by motorists, to raise awareness (among motorists, police, and city officials) of cyclists on the road, to have motorists know we only want to share the roads, and to show that cyclists are not going away. It's an important statement, so this is a call to all riders to help us make a great showing. It's a chance to let our neighbors know who we are and gain their respect. Take the time to raise consciousness and make a difference. Also lights and helmets are required...and anyone under the age of 18 must be accompanied by an adult. The route doesn't seem to make any sense, but what the hell.